Matt Hagan drove to the provisional Funny Car pole in Kent, Wash. on Friday. Hagan drove to the preliminary pole at the 31st annual CatSpot NHRA Northwest Nationals Friday at Pacific Raceways in Kent, Wash. Hagan covered the 1,000-foot distance in 3.913-seconds at 324.75 mph during the second session in search of his fourth No. 1 qualifier of the season and first at the facility outside Seattle. This weekend’s event will wrap up NHRA’s annual three-race summertime trip from Morrison, Colo., to Sonoma, Calif., into the Great Northwest. Point-leader Steve Torrence (Top Fuel) and Jeg Coughlin Jr. (Pro Stock) also emerged as preliminary No. 1 qualifiers in their respective categories at the 16th of 24 events on the 2018 Mello Yello Drag Racing Series schedule. Hagan credited the team’s new Dodge Hellcat body _ which made its competitive debut two races prior at the start of the Western Swing at Norwalk, Ohio, on June 21 _ for Friday’s performance. “Right now, it’s all about dialing the car in and dialing this new Hellcat body in with the headers and everything else we’re doing,” said Hagan, a two-time world champion for Don Schumacher Racing. “It’s running better than what we’re trying to run with it. It’s going to take a few runs but all in all, I feel like (crew chief) Dickie Venables has a really good handle on it. The 2013 Funny Car event winner at Pacific Raceways, Hagan earned his most recent pole during the NHRA New England Nationals in Epping, N.H., on July 7. He went on to score his third victory of the season the following afternoon. Two-time/reigning world champion Robert Hight of John Force Racing, the defending event champ, is second after his run of 3.919-seconds at 327.82 mph in his Chevrolet Camaro SS. Torrence took the lead in Top Fuel with his second 1,000-foot pass of 3.723-seconds at 331.61 mph in his Torrence Racing dragster. Torrence is seeking his first career pole at Pacific Raceways and 18th of his career. Doug Kalitta sits second with a 3.730-second run at 326.00 mph in his Kalitta Motorsports dragster. 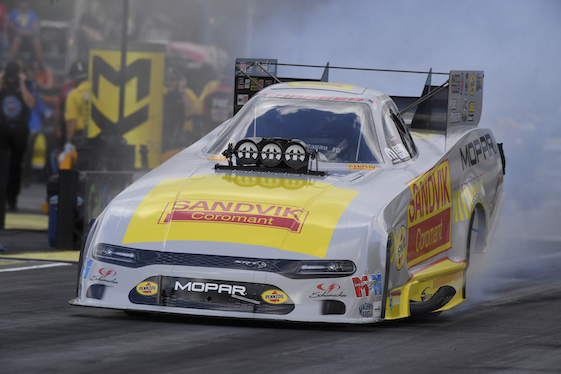 Coughlin powered to the top of the Pro Stock category by covering the traditional quarter-mile in 6.501-seconds at 212.16 mph during the second round. The five-time “Factory Hot Rod” world champion is focused on securing his second pole and fourth victory of the season. Point-leader Greg Anderson, a four-time world champ, is second following a 6.503-second pass at 211.79 mph in his Ken Black Racing Camaro during the first round. The conclusion of qualifying will be televised Saturday on FOX Sports 1’s “Saturday Nitro Live” from 10-11:30 p.m. (EDT). The FOX Network will air three hours of finals coverage Sunday beginning at 4 p.m.
Top Fuel _ 1. Steve Torrence, 3.723-seconds, 331.61 mph; 2. Doug Kalitta, 3.730, 326.00; 3. Clay Millican, 3.743, 330.47; 4. Tony Schumacher, 3.751, 327.03; 5. Antron Brown, 3.761, 330.80; 6. Leah Pritchett, 3.764, 321.73; 7. Mike Salinas, 3.779, 325.85; 8. Brittany Force, 3.785, 326.32; 9. Richie Crampton, 3.792, 323.50; 10. Scott Palmer, 3.815, 323.81; 11. Shawn Reed, 3.881, 290.32; 12. Troy Buff, 3.890, 303.64; 13. Terry McMillen, 3.892, 311.34; 14. Jim Maroney, 3.932, 283.13; 15. Bill Litton, 3.970, 307.86. Funny Car _ 1. Matt Hagan, Dodge Charger, 3.913, 324.75; 2. Robert Hight, Chevy Camaro, 3.919, 327.82; 3. Courtney Force, Camaro, 3.927, 325.69; 4. Bob Tasca III, Ford Mustang, 3.943, 321.19; 5. Tim Wilkerson, Mustang, 3.963, 317.27; 6. Shawn Langdon, Toyota Camry, 3.977, 325.37; 7. Tommy Johnson Jr., Charger, 3.977, 321.35; 8. Jonnie Lindberg, Mustang, 3.995, 315.42; 9. Ron Capps, Charger, 4.018, 318.47; 10. J.R. Todd, Camry, 4.056, 308.43; 11. Jim Campbell, Charger, 4.073, 307.09; 12. Gary Densham, Mustang, 4.085, 309.98; 13. Richard Townsend, Camry, 4.136, 274.39; 14. Jeff Diehl, Camry, 4.215, 281.89; 15. John Force, Camaro, 6.260, 105.47; 16. Terry Haddock, Mustang, 6.488, 108.39. Not Qualified _17. Jack Beckman, 7.192, 97.47; 18. Cruz Pedregon, broke. Pro Stock _ 1. Jeg Coughlin Jr., Chevy Camaro, 6.501, 212.16; 2. Greg Anderson, Camaro, 6.503, 211.79; 3. Erica Enders, Camaro, 6.506, 212.66; 4. Tanner Gray, Camaro, 6.510, 212.09; 5. Jason Line, Camaro, 6.518, 211.73; 6. Deric Kramer, Camaro, 6.522, 211.56; 7. Bo Butner, Camaro, 6.526, 211.96; 8. Vincent Nobile, Camaro, 6.527, 211.33; 9. Chris McGaha, Camaro, 6.541, 211.83; 10. Alex Laughlin, Camaro, 6.541, 210.80; 11. Drew Skillman, Camaro, 6.553, 211.13; 12. Matt Hartford, Camaro, 6.557, 209.95; 13. Fernando Cuadra, Camaro, 6.564, 210.54; 14. Alan Prusiensky, Dodge Dart, 6.615, 209.01; 15. Steve Graham, Camaro, 6.637, 208.91; 16. Joey Grose, Camaro, 8.319, 117.73.